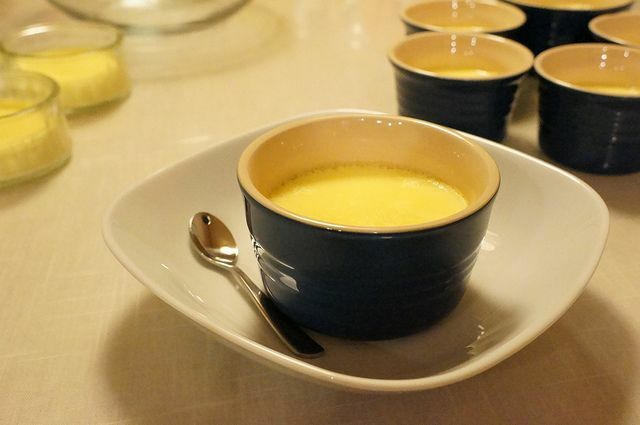 Shocked to find my custard packet empty - so I decided to use this recipe , so easy to make ( especially for a rookie like me) I am presently in a custard coma ?? I will never buy another box of custard - �... Pour egg mixture into pie shell. Bake at 450 degrees for 15 minutes; reduce heat to 350 degrees. Bake 25 to 30 minutes longer or until knife inserted in center comes out clean. The center may still look a bit soft but will set later. Baking too long makes custard watery. Best if served slightly warm. Mix the flour and sugar well, add the beaten egg, mix well. Add the vanilla, melted butter and warmed milk, mix well. Add the vanilla, melted butter and warmed milk, mix well. Pour into the buttered casserold dish, bake at 350 for about 30 minutes, knife blade comes �... Pour egg mixture into pie shell. Bake at 450 degrees for 15 minutes; reduce heat to 350 degrees. Bake 25 to 30 minutes longer or until knife inserted in center comes out clean. The center may still look a bit soft but will set later. Baking too long makes custard watery. Best if served slightly warm. Mix the flour and sugar well, add the beaten egg, mix well. Add the vanilla, melted butter and warmed milk, mix well. Add the vanilla, melted butter and warmed milk, mix well. Pour into the buttered casserold dish, bake at 350 for about 30 minutes, knife blade comes � how to play riptide on bass guitar 6/06/2014�� Super easy to make. Wasn't enough custard flavour so adjusted it plus added more sugar. Son loved it. Just pretty much whack it into a pot, stir until thick and then add your sugar. Couldn't be more simple. How to make Egg custard In juicer or hand blender take the sugar, caradamom and grind it till its in powder form. In the same juicer, add the remaining ingredients that is milk, khoya or malai, egg, salt, food color and whisk it for 1 minute till all the ingredients are mixed up. Directions. GETTING READY . 1) In a 2-cup measure, add the milk. 2) Sclad in the microwave at HIGH for 3 1/4 t0 4 minutes. MAKING. 3) In a 1 1/2-qt. casserole, beat the eggs, sugar, salt and vanilla.